Salivary Glands Malignant Neoplasms (SGMNs) account for 3-6% of head and neck cancers and 0.3% of all cancers. Tumor cells that express CD44 and CD24 exhibit a stem-cell-like behavior. CD44 is the binding site for hyaluronic acid, and CD24 is a receptor that interacts with P-selectin to induce metastasis and tumor progression. The present study aims to evaluate the expression of CD44 and CD24 on SGMNs and correlated these data with several clinicopathologic features. Immunohistochemical stains for CD44 and CD24 were performed on tissue microarrays containing SGMN samples from 69 patients. The CD44, CD24 and CD44/CD24 expression phenotypes were correlated to patient clinicopathologic features and outcome. CD44 expression was associated with the primary site of neoplasm (p = 0.046). CD24 was associated with clinical stage III/IV (p = 0.008), T stage (p = 0,27) and lymph node (p = 0,001). The CD44/CD24 profiles were associated with the primary site of injury (p = 0.005), lymph node (p = 0.011) and T stage (p = 0.023). Univariate analysis showed a significant relationship between clinical staging and disease- free survival (p = 0.009), and the overall survival presents relation with male gender (p = 0.011) and metastasis (p = 0.027). In summary, our investigation confirms that the clinical stage, in accordance with the literature, is the main prognostic factor for SGMN. Additionally, we have presented some evidence that the analysis of isolated CD44 and CD24 immunoexpression or the two combined markers could give prognostic information associated to clinicopathologic features in SGMN. The virtual slide(s) for this article can be found here: http://www.diagnosticpathology.diagnomx.eu/vs/1284611098470676. Salivary Glands Malignant Neoplasms (SGMNs) are relatively rare malignant solid tumors. They represent a group of tumors that present favorable features concerning to loco-regional invasion and metastasis. The estimated global incidence rate of SGMN varies from 0.4 to 2.6 cases per 100,000 people. Because SGMNs account for 3% to 6% of all head and neck cancers, it represents only 0.3% of all human malignancies. Following the discovery of hematopoietic stem cells, the “cancer stem cell” theory was proposed[4–7]. Currently, the most accepted theory for the etiopathogenesis of cancer is that the tumor starts as a single cell that shares some features with normal stem cells (SC)[4–6]. This cancer stem cell (CSC) may be involved in cancer initiation, maintenance of tumor growth, progression, tumor recurrence and may also predict tumor treatment outcome. SC and CSC have been identified in most tissues and solid tumors including in the brain, colon, breast melanocytic cells, pancreas and prostate. There is evidence that tumor cells which express CD44 and CD24, exhibit a stem-cell-like behavior. CD44 is an important receptor for hyaluronate (HA). The functions of this transmembrane receptor include coordination of cell motility, cell-cell adhesion, lymphocyte activation, cell migration and cellular-extracellular matrix interaction. Besides the interaction with HA, the CD44 protein has also been shown to interact with other proteins in the extracellular matrix including fibronectin, collagen types I and IV, serglycin and osteopontin. The CD44 receptor is one of the most frequently studied SC markers, and CD44 expression is associated with epithelial tumors, although the results show different correlations in each tissue analyzed. Increased CD44 expression has been observed in aggressive gastric cancer. Wielenga et al. demonstrated that CD44 variant, v6, is strongly related to tumor progression, supporting the concept that CD44 plays an important role in human colorectal tumor metastasis. However, irregular or low expression of CD44 was related to poor prognoses in oral squamous cells carcinoma[16, 20–22]. CD24 is a glycosylphosphatidylinositol-linked cell surface glycoprotein. It has been identified as a P-selectin ligand and adhesion receptor for platelets and activated endothelial cells. The CD24 protein is expressed in keratinocytes, renal tubules, regenerating muscles and the developing brain and pancreas. It may be involve as a regulator factor for the control of cell proliferation, cell adhesion and apoptosis. However, the expression and physiological function of CD24 in human malignancies has not yet been completely elucidated. In human carcinomas, there is evidence that CD24 expression is related to prognosis and may contribute to metastasizing tumor cells, but the relationship between CD24 and prognosis is not completely understood. Some studies have reported the correlation between CSC and unregulated expression of CD44 and CD24[10, 12]. However, the existence of CSCs in SGMN and their (CSCs) putative influence on the behavior of SGMN merit further investigation. Thus, the present study aim to investigates the expression of CD44 and CD24 in SGMNs and the association of CD44/CD24 immunophenotypes to the clinicopathologic features of SGMNs. Sixty-nine cases of SGMN, diagnosed between 1990 and 2009, were retrieved from the medical files of the Department of Pathology, Ribeirão Preto Medical School, University of São Paulo, Brazil. The medical files were analyzed to collect information on age, gender, primary anatomic localization, tumor evolution, history of smoking and alcohol intake, histological classification, nodal status, treatment, tumor recurrences, disease-free survival (DFS) and overall survival (OS). The study protocol conformed to the ethical guidelines of the 1975 Declaration of Helsinki and was carried out with the approval of the Ribeirão Preto Medical School Human Research Ethics Committee. The following inclusion criteria were applied: 1) sufficient of clinicopathologic data; 2) histological diagnosis of mucoepidermoid carcinoma (MC), adenoid cystic carcinoma (ACC), acinic cell adenocarcinoma (ACA), adenocarcinoma (nos) (A (nos)), carcinoma ex-pleomorphic adenoma (Cex-PA), salivary duct carcinoma (SDC), polymorphous low-grade adenocarcinoma (PLGA), basal cell adenocarcinoma (BCA) or malignant myoepithelial neoplasm (MMN) (diagnoses as defined by the World Health Organization)); 3) no previous head and neck cancer; 4) no prior oncologic therapy. In accordance with Wittekind et al. all cases were staged according to TMN classification. For statistical analysis, the smoking and alcohol intake history was dichotomized: the patients were classified as “current consumers” or “never consumers”. Current consumers of tobacco were those individuals who used a cigarette, pipe, and/or cigar daily, and current alcohol consumption was defined as daily use of wine, beer, and/or other distilled drinks. “Never consumers” were those who had quit alcohol and/or tobacco consumption more than 12 months prior to diagnosis. Hematoxylin and eosin (H&E) stained slides from 69 cases of SGMNs were reviewed by an experienced pathologist (ARS) to detect the most significant tumor areas. These areas were then selected for assembly into the TMA paraffin block. Representative 2-mm cores from selected areas from each tumor were detached and allocated to a recipient paraffin block using a manual tissue-arraying instrument (“Tissue Micro-Array Builder,” Histopathology, Ltd., Akác u. 8, 7632 Pécs, Hungary, Baranya). Three-micrometer-thick sections were cut from the TMA paraffin blocks using a paraffin tape-transfer system (Instrumedics, Saint Louis, MO, USA). The first and final sections were stained with H&E to confirm the presence of SGMN by light microscopy. All 69 samples were fixed in 4% neutral formalin and embedded in paraffin. Three-micrometer-thick sections were cut from the TMA paraffin blocks. The sections were dewaxed in xylene and rehydrated by immersing in a series of graded alcohols. Endogenous peroxidases were blocked using a solution containing 0.3% hydrogen peroxide for 30 min. The paraffin sections were then placed in 10 mM citrate buffer and submitted to heat retrieval, using a vapor lock, for 40 min. Following antigen retrieval, the slides were allowed to cool at room temperature for 30 min, and the sections were then incubated with the primary antibody at 4°C overnight. The dilution, clone and source of the antibodies used in this study were CD44 (mouse monoclonal antibody 1:100, clone DF1485, Novocastra, Newcastle upon Tyne, United Kingdom) and CD24 (mouse monoclonal antibody 1:50, clone SN3b, Thermo Scientific, Fremont, CA, USA). Following overnight incubation with the appropriate primary antibody, all sections were incubated with post-primary solution, for 30 minutes, and then incubated with the polymer (both provided by Biocare Medical Mach 4 Universal Polymer Detection System, Concord, California, USA) for 30 minutes. The reaction was developed by adding diaminobenzidine (DAB), and the sections were counterstained with hematoxylin. Finally, the slides were dehydrated in a graded series of alcohols and mounted with permount. The percentages of CD44 and CD24 positive cancer cells were determined by two observers (ARS and LRO) with a blind fashion. Discrepancies between the observers were resolved by conference, achieving consensus for each case. The IHC reaction was carried out on two slides at different depth levels through the tumor to increase the accuracy and the robustness of the array-based data. Negative controls were prepared by omitting the primary antibody, for the both antibodies were used human tonsil tissue as positive controls. In accordance with protocols devised by Honeth and colleagues CD44 staining was detect in the membrane and scoring was as follows: 0, 0% positive tumor cells; 1, 1% to 10% positive cells; 2, 11% to 50% positive cells; 3, 51% to 75% positive cells; and 4, 76% to 100% positive cells. The cases classified as 1 or superior were considered positive to quantitative analysis. The quantification of CD24 was evaluated in accordance with protocols devised by Kristiansen and colleagues. CD24 staining was detected in the membrane and cytoplasm. Negative controls showed no signs of staining, as positive controls were used human tonsil tissue. Cases presenting unequivocal staining were classified as positive. For prognostic investigation and survival analysis, the immunophenotypes patterns were grouped: CD44 + /CD24+ (CD44 positive case/CD24 positive CD44 + /CD24- (CD44 positive case/CD24 negative case), CD44-/CD24+ (CD44 negative case/CD24 positive case), CD44-/CD24- (CD44 negative case/CD24 negative case). The double-immunolabeling study was performed according to the manufacturer’s protocol (EnVision Doublestain System; Dako, Carpinteria, CA, USA). The CD44 was developed with DAB (brown), and the CD24 was developed with fast red (red) (Figure 1D). Immunohistochemical staining for CD44 and CD24 A) CD44 positive (membrane staining) in case of mucoepidermoid carcinoma (× 200) ; B) CD24 positive (membrane and cytoplasmic staining) in case of in case of mucoepidermoid carcinoma. 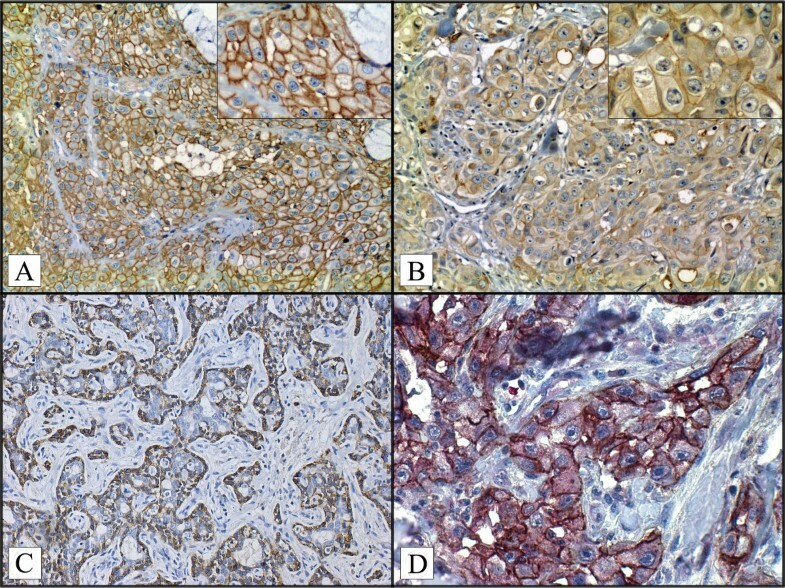 (× 400) (detail in right upper panel) C) CD44 positive (membrane staining was observed only on myoepithelial component) in case of adenoid cystic carcinoma (× 200), D) Double immunohistochemical reaction of CD44 and CD24 in mucoepidermoid carcinoma. CD44 positive are indicated in brown (DAB, membrane staining). CD24 positive cell are indicated in red (Fast red, cytoplasm), magnification x400. Statistical analyses were performed using the commercially available PASW Statistics 18.0 software (Chicago, IL, USA). The correlations of CD44, CD24 expression and clinicopathologic features were tested with contingency tables using Fisher’s exact test (two variables) or χ2 (three or more variables) tests. The OS rate was defined as the interval between the diagnosis and the date of death (uncensored data) or the date of the last available clinical information (censored data). The DFS was defined as the time from diagnosis until the occurrence of local recurrence or metastasis. Univariate analyses were performed using Kaplan-Meier curves and the log-rank test to compare and estimate cumulative survival rates. Multivariate Cox proportional hazard regression was used to correlate the risk factors with independent prognostic properties. Due to their limited number, the CD44-/CD24+ cases were removed from analyses. All tests were two- tailed and P-values < 0.05 were considered statistical significance. A total of 69 patients with SGMN (28 men (40.5%) and 41 women (59.5%) were used for the immunohistochemical study. Age ranged from 13 to 85 years with a mean age of 54,8 years. The age of male range from 23 and 85 years, with a mean age of 58 years. The ages of female were range from 13 and 85 years (average 51.5 years). Information on history of smoking and alcohol intake showed a total of 23 (33.3%) tobacco users and 14 (20.3%) alcohol users. In the present study, 27 (39.1%) tumors were found in the parotid gland, 13 (18.8%) tumors in the submandibular gland, 27 (39.1%) tumors in the minor salivary glands and 2 tumors (2.9%) in the sublingual gland. The neoplasms were classified as mucoepidermoid carcinoma (11 cases (15.9%)), adenoid cystic carcinoma (34 cases (49.3%)), acinic cell adenocarcinoma (4 cases (5.8%)), adenocarcinoma ,NOS (5 cases (7.2%)), polymorphous low-grade adenocarcinoma (3 cases (4.3%)), basal cell adenocarcinoma (5 cases (7.2%)), carcinoma ex- pleomorphic adenoma (4 cases (5.8%)), and salivary duct carcinoma (3 cases (4.3%)). The diameter of the tumors ranged from 0.3 cm to 8.0 cm. Twenty-five cases (36.2%) were classified as T1 tumors and 17 cases (24.6%) were T2 tumors, 16 cases (23.2%) were T3 tumors, 11 cases (15.9%) were T4 tumors. In these samples, 16 cases (23.2%) were classified as being in stage I, 8 cases (11.6%) were in stage II, 11 (15.9%) cases were in stage III and 34 cases (49.3%) were classified as being in stage IV. All 69 patients underwent surgical treatment. Following the surgical treatment, 50 patients received adjuvant therapy, 30 patients received only radiotherapy, 4 received only chemotherapy and 16 patients were received both chemotherapy and radiotherapy. Metastases developed in 26 patients, 24 patients developed loco-regional recurrence, 11 patients developed lymph node metastasis and 21 patients died during the course of the study. The disease-free survival and the overall survival ranged from 1 month to 248 months (the DFS mean was 52 months and OS mean was 62 months). The clinical features are summarized in Table 1. RT: Radiotherapy; CT: Chemotherapy; a PLS: Primary Lesion Site; b PG: Parotid Gland; c SubM.G: Submandibular Gland; d SubL.G: Sublingual Gland; e MinorG: Minor Salivary Glands. MC: mucoepidermoid carcinoma; ACC: adenoid cystic carcinoma; ACA: acinic cell adenocarcinoma; A (nos): adenocarcinoma; Cex-PA: carcinoma ex-pleomorphic adenoma; SDC: salivary duct carcinoma; PLGA: polymorphous low-grade adenocarcinoma; BCA: basal cell adenocarcinoma (BCA); MMN: malignant myoepithelial neoplasm. Clinicopathologic features (gender, age, smoking and alcohol intake history, lymph node metastases, clinical and T stage, loco-regional recurrence, metastasis and death) were tested with contingency tables using Fisher’s exact test (two variables) or χ2 (three or more variables) tests and P-values < 0.05 were considered statistical significance. The present data shown association between gender and death, were observed that male patients had a high number of death events during the course of the study (p = 0.017), The metastasis process has also presents a relation with death (p = 0,007), positive metastasis patients presents increased death proportion. Our research has also found association between local-recurrence, clinical stage and metastases. The analysis demonstrates a higher proportion of patients positives to local-recurrence associated to advanced clinical stage (III and IV) (p = 0.044) and were observed, during the course of the study, patients presenting local-recurrence had a high propensity to distant metastasis (p = 0.010). All the remaining statistical comparison of clinicopathologic features were considered no statistical significant. The positive controls to CD44 and CD24 were used human tonsil tissue. We observed in normal salivary glands CD44 widely expressed by acinar cells (membranous stain), however CD24 do not present staining (membranous and citoplasmatic stain), in normal gland. CD44 membrane expression (Figure 1A) was verified in 50 of 69 cases (72.4%). Eighteen cases were positive for CD24 (Figure 1B). The CD44 expression on Adenoid cystic (26 cases) was moderate to strong staining, cytoplasmic and membranous was observed on myoepithelial component. Mucoepidermoid carcinoma positive cases (7 cases) showed weak to strong patchy membranous epidermoid cell staining. Acinic cell carcinoma (4 cases) and Carcinoma Ex-pleomorfic Adenoma (3 cases) positive cases displayed focal weak to moderate membranous staining. The Polymorphous low-grade (1 case) showed moderate patchy of membranous staining, Adenocarcinoma (NOS) 5 cases and salivary duct carcinoma (2 cases) exhibited moderate focal areas of membranous staining, and Basal Cell Adenocarcinoma (2 cases) exhibited weak diffuse membranous staining throughout the tumoral islet. However, the CD24 displayed focal weak to moderate membranous/citoplasmatic staining in SGMN (mucoepidermoid carcinoma 3 cases), adenoid cystic carcinoma (12 cases), carcinoma ex-pleomorphic adenoma (1 case), and salivary duct carcinoma (2 cases). The CD44 expression was associated with major salivary gland topography (p = 0.046). CD24 expression was associated with T stage (p = 0,27) and lymphnode metastasis (p = 0,001). The 69 cases were grouped according to CD44/CD24 profiles as follows: 36 cases (52.2%) were CD44+/CD24-; 15 cases (21.7%); were CD44-/CD24-; 14 cases (20.3%) were CD44+/CD24+ (Figure 1D) and 4 cases (5.8%) were CD44-/CD24+. The profiles CD44/CD24 correlated with primary lesion site (p = 0,005), lymphnode metastasis (p = 0,011) and T stage (p = 0,023). All of the immunohistochemical findings and relationships to clinicopathologic features concerning the CD44/CD24 profiles are summarized in Tables 2 and3. a PLS: Primary Lesion Site; bMajor: Major Salivary Glands ( Parotid Gland/Submandibular Gland/Sublingual Gland); cMinor; Minor Salivary Glands; d Sur. Adj. T.: Surgery with adjuvant therapy. Statistically significant difference (<0.05) by Fisher’s exact test (two variables) or χ2 (three or more variables) tests. a +/+ cases CD44+/CD24+; +/− cases CD44+/CD24- and −/− cases CD44-/CD24-; −/− cases CD44-/CD24+. bPLS: Primary Lesion Site; cMajor: Major Salivary Glands ( Parotid Gland/Submandibular Gland/Sublingual Gland); dMinor; Minor Salivary Glands; e Sur. Adj. T.: Surgery with adjuvant therapy. Statistically significant difference (<0.05) by Fisher’s exact test (two variables) or χ2 (three or more variables) tests. The Kaplan-Meier analysis establish a significant relationship between gender and OS (p = 0.011) and the present data demonstrate that patients developing metastasis has reduced its OS (p = 0.027). The univariate survival analysis also demonstrated a significant relationship between clinical staging and DFS (p = 0.009). Kaplan–Meier tests also showed that CD44 expression had no statistical significance when correlated to DFS or OS (p = 0.319 and p = 0.447, respectively). CD24 expression, with respect to OS and DFS, had no statistical significance (p = 0.519 and p = 0.081, respectively). The DFS and OS multivariate analysis (Cox proportional hazard regression model) had no statistical significance (p = 0.085 and p = 0.061, respectively). Kaplan–Meier graphics for parameters that had statistical significance are summarized in Figure 2. Univariated analysis. A) Kaplan-Meier plots of cumulative survival percentage in Disease free survival curve according to SGMN clinical stage in the studied patients. B) Kaplan-Meier plots of cumulative survival percentage in Overall survival curve according to patients gender. C) Kaplan-Meier plots of cumulative survival percentage in Overall Survival curve according to metastasis event in the studied patients. Statistically significant difference (<0.05). The literature shows that clinical staging is the main prognostic factor for SGMN[3, 30, 31]. Our data are in agreement with this assessment. The present study observed patients in an advanced clinical stage (III/IV) with relation to loco-regional recurrence. In our study, clinical staging also correlated with DFS by Kaplan–Meier tests. The clinical stage was proved to be an independent prognostic factor in the studies of Bell et al. and Lima et al.. Similar, the present study demonstrated that patients in an early clinical stage had a better prognosis. CD44 is main receptor for hyaluronate. CD44, 80 to 95KDa transmembrane protein has a pivotal role in cell-extracellular matrix interaction. Besides the extracellular interaction with HA, fibronectin, collagen types I and IV, serglycin and osteopontin CD44 forms a complexes with ERM (ezrin-radixin-moesin) to establish a link with actin cytoskeleton. The CD44 receptor is one of the most studied markers for stem cells and is overexpressed in a large number of solid neoplasms. Among the previous CD44 analyses in epithelial tumors, some investigators found relation between this protein and stem cells behavior, suggesting the CD44 as key marker of this cell population. However, recently the role of CD44-expression in solid neoplasms as a tumour marker for stem cells is discussed and controversial. The relation between CD44 and neoplasms presents the breast cancer as the most well studied neoplasm; an experimental assay demonstrates that tumors within CD44-positive cell population possess cancer stem-cell behavior (10). Similar to these results the cancer stem-cell behavior of CD44-positive cells has also demonstrated in head and neck squamous cell carcinomas. Further findings demonstrate that CD44 expression can be related to clinicopathological features and the expression of immunohistochemical markers of prognostic significance. In an immunohistochemistry breast invasive ductal carcinoma study Oliveira-Costa and collaborators demonstrated the relation between CD44 expression and HIF1-Alpha status and HER-2 expression influencing the patient prognosis. Choi and collaborators observed an association between CD44 expression and tumour size studding colorectal adenocarcinoma. Notwithstanding, The patients outcome has also been influenced in oral squamous cells carcinoma, the CD44+ subpopulation was a independent factor of a poor prognosis. Nevertheless, the effect of CD44 expression on malignant neoplasms still demonstrates conflicting results, some paper demonstrated that decreased CD44-expression could influence a worse prognosis for the patient[20, 21] in endometrioid carcinoma the CD44-expression was observed and no association was found between the protein expression and clinicopathological features suggesting that CD44-expression predictive prognostic factor. Examining salivary glands was demonstrated that CD44v3 and v6 variants are widely expressed by myoepithelial and acinar cells, suggesting that these myoepithelial cells may play a critical role in normal salivary gland renewal and may play a role in the control of growth of salivary gland tumors considered to be derived from modified myoepithelial cells. Franchi and colleagues reported an intense expression of CD44 and CD44v6 in pleomorphic adenomas. This expression was observed in tubular structures, solid areas and areas with myxoid matrix or chondroid matrix production. They also verified that malignant neoplastic cells in carcinoma ex-pleomorphic adenoma cases were positive for CD44. Our data provide an interesting find related between CD44-expression and adenoid cystic carcinoma, was observed an expression of CD44 in myoepithelial component, however, the ductal component presents no expression (Figure 1C). ACC has an indolent nature and predilection to late distant metastasis. ACC shares histopathological features with PMLG. Thus transforming the diagnosis in a challenge to pathologists to decrease the diagnostic difficulty several markers were suggested, an example is the proliferation marker MCM2 suggested by Ghazy and collaborators (2011). Supported by our Immunohistochemical findings we also suggest that CD44 could be used to differentiate borderline cases. However, further studies with large number of cases are recommended to support the idea. Our data has also provided evidence for a significant association between CD44 expression and SGMN in major salivary glands. This relationship was also suggested by the increased amount of positive staining in major salivary glands tumors when compared with neoplasms from minor salivary glands. A hypothetical explanation for the differential expression of CD44 could be the variation in histological features between the salivary glands and/or embryological development via the epithelium-mesenchyme relationship. The CD24 receptor is a heavily-glycosylated protein constructed of 27 amino acids attached to the cell membrane by a GPI-anchor. It was described as b-cell marker, and its expression is associated with b-cell development[24, 45]. CD24 is related to P-selectin, an adhesion receptor for platelets and activated endothelial cells. The association between CD24 and P-selectin was confirmed due to the interaction of mammary cancer cells and P-selectin in activated platelets. This correlation suggests that CD24 plays an important role in metastatic events in human cancers. CD24 is considered as a new marker for stem cells. This cell surface glycoprotein is grouped together with classical stem cells markers such as CD44, CD133 and CD117. In animal models, the expression of CD24 is observed in submandibular glands[47–49], Naduri and colleagues observed positive staining for CD24 in the submandibular excretory duct. This expression suggests a correlation between CD24 expression and the development of branching epithelium. Our study has shown positive CD24 expression in 9 SGMN cases. On the other hand Ma and colleagues reported that metastatic adenoid cystic carcinoma cell lines lack CD24 expression. Our results, in conjunction with the results of Ma and colleagues, indicate that CD24 expression is not well established in SGMN. Our analysis of the CD24-positive cells in SGMN showed an association between CD24 expression, T stage and clinical stage. Cases that expressed CD24 were positively associated TIII/TIV tumors and with cancer stages III / IV. These results may suggest that CD24 correlates with advanced-stage SGMN. The present study found no correlations between CD24 expression (total, cytoplasmic or membranous) and overall survival. We have also found no correlations between CD24 expression (total, cytoplasmic or membranous) and disease free survival. Oliveira and colleagues, studying oral squamous cell carcinoma, have also found no relationship between total CD24 expression and overall survival. However, the CD24-cytoplasmic expression showed a correlation with disease free survival and overall survival. Kristiansen and colleagues highlighted that several studies analyzed only CD24-membranous expression although CD24-cytoplasmatic expression is usually presented as a prognostic factor for human cancer. Both CD44 and CD24 have been established as stem cell surface markers and have been tested in several groups of tissues and cancers[8–13]. The CD44/CD24 immunophenotypes behavior shows great diversity in human cancers. In lesions of invasive breast cancer, Mylona and colleagues showed a correlation between the CD44+/CD24- immunophenotype and negative lymph node metastasis and lower staged tumors. However, this result disagrees with the findings of Abraham and coworkers that suggested an association between the CD44+/CD24- immunophenotype and distant metastasis but not with the clinical outcome. In vitro findings suggest that breast cancer cells with lymphatic metastatic ability and expressing the CD44+/CD24- immunophenotype have clonogenic potential and a higher ability to survive and grow in unfavorable environments. In human cases, however, Giatromanolaki and colleagues found that breast cancer patients that present with CD44-/CD24- cells had a worsened overall survival. Our data suggest that the relationship between CD44 and CD24 may have important role on clinicopathologic features. The immunophenotype CD44+/CD24- was the most prevalent, appearing in 52,2% of salivary glands tumors. Except for the double negative phenotype (CD44-CD24-), all of the immunophenotypes had a prevalent number of cases involving the major salivary glands. This result may suggest a lower activity of stem cells in minor salivary glands neoplasms. This finding could have therapeutic implications. A lower stem cell activity could result in an improved response to therapies aimed at eradicating minor salivary gland tumors. These diverse results reflect the controversial biological characteristics described by Carrillo and coworkers in minor salivary gland neoplasms. Factors that may influence disease free survival rates are histological type, tumor grade and clinical stage. However, clinical stage is the principal prognostic factor for predicting disease outcome[1, 3, 30, 31]. Our findings are in accordance with this literature-derived data. The present study shows that SGMN with CD44+/CD24+ profile may represents the tumors with most aggressive behavior and worst prognosis. CD44+/CD24+ profiles was associated with tumor size and lymph node metastasis. The majority of the CD44+/CD24+ cases (66,6%) were classified as T3/T4 and the rate of positive lymph node metastasis was higher than the expected (35.7%). Thus, the double positive (CD44+/CD24+) profile may be correlated with the more advanced tumors and rapid disease development. This aggressive cell behavior was also demonstrated in CD44+/CD24+ pancreatic cancer cells. Injection of CD44+/CD24+ cells into an animal model resulted in tumors a mere 3 weeks after injection. The same results were not achieved with CD44-/CD24- pancreatic cancer cells. These data demonstrate the tumorigenic potential of pancreatic cancer cells bearing the CD44+/CD24+ immunophenotype. This phenomenon was also observed in the study conducted by Huang and coworkers, where CD44+/CD24+ pancreatic cancer cells showed an exacerbated tumorigenic potential. Because stem cells from salivary gland tissue and pancreatic tissue have similar capacities for proliferation and differentiation, due to their similar aggressive capacity, we can assume that the cancer stem cell from both tissues also has similar abilities. In summary, our investigation confirms that the clinical stage, in accordance with the literature, is the main prognostic factor for SGMN. Additionally, we have presented some evidence that the analysis of isolated CD44 and CD24 immunoexpression or the CD44/CD24 immunophenotypes could give a prognostic informations associated to clinicopathologic features Salivary Gland Malignant Neoplasms. The authors acknowledge the technical assistance of Deisy Mara da Silva. This work was supported by grants from Fundação de Amparo à Pesquisa do Estado de São Paulo (FAPESP 2011/18587-2) Brazil. DFS, JPOC, GGS are sponsored by FAPESP, Brazil. DFS participated in the sequence alignment, performed the statistical analysis and drafted the manuscript. GGS participated in the sequence alignment. JPOC participated in the design of the study and performed the statistical analysis. RCFI participated in the design of the study. LRO conceived of the study, and participated in its design. SVL conceived the study and participated in its design. ARS conceived of the study, and participated in its design of the study and coordination and helped to draft the manuscript. All authors read and approved the final manuscript.